If you are a parent of a school aged child you know this time of year is fraught with back to school preparations. Purchases of sneakers, lunch boxes, pencils and rainbow-colored pocket folders fill your days. In my house, it is also a time for reorganization. Everyone in my household goes through closets and drawers to decide what stays and what goes. It has been obvious for some time now that my daughter has outgrown her precious Pottery Barn play table. No longer do the toddler sized chairs comfortably fit my leggy girl. I needed to find a proper desk for my soon to be teenager. First stop when looking for furniture is always my storage space. While rummaging through my dusty belongings I find a 100-year-old desk I had forgotten about. A lovely maple piece handed down generation to generation starting with my husband’s great grandmother. This isn’t some treasured meticulously adorned antique, but instead a very utilitarian work surface. Maybe it was its easy usability which kept it cornered from house to house, year after year until now. Looking at the desk it is clear it has lived many lives. In places, the varnish is worn away, chipped and cracked. I imagine countless letters written, coffee cups forgotten, bills stacked and paid. Before installing it in its new home, I felt it deserved some TLC. 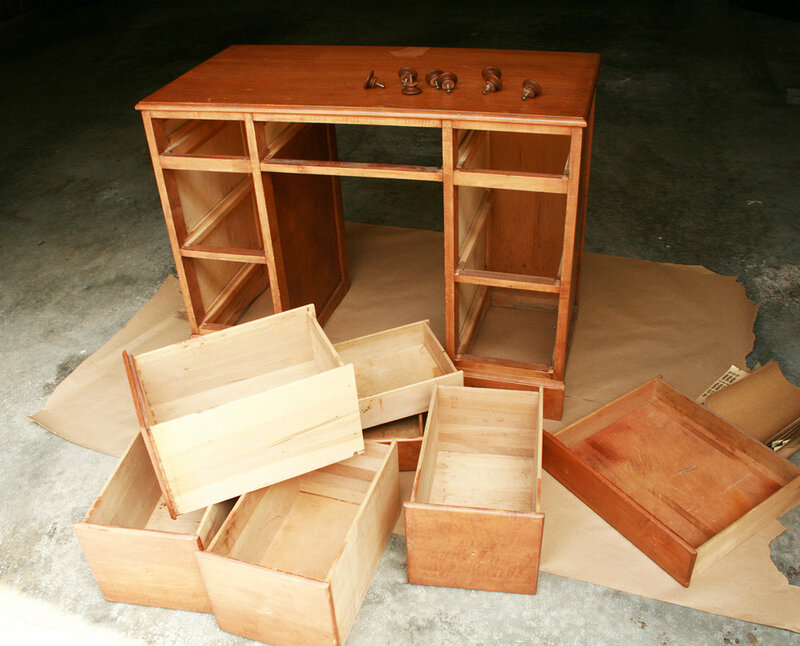 Here are the steps I took to make this century old treasure ready for its next life. With any project, I start a supply list. I pull aside all supplies and tools I will need, and purchase any I don’t already own. When working on refinishing furniture, Bloomington Paint and Wallpaper and Bloomington Hardware are both excellent resources for anything you might need. With a bucket of hot soapy water, I gave this old lady a good scrubbing. I find mild dish soap and hot water usually does the trick. 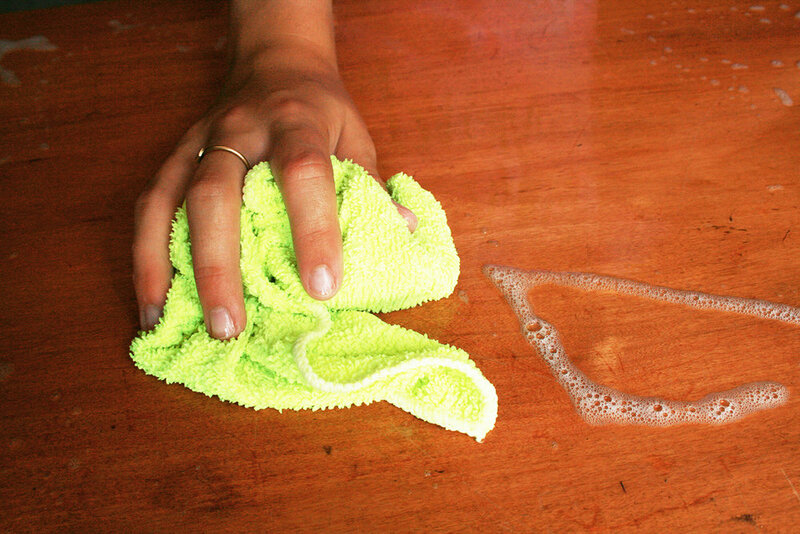 If your furniture has a smoky or mildewy smell add in a cup or two of white vinegar. Once dry I start working away the coats and coats of varnish. Some of you may prefer to use a chemical stripper, but I like the controllability of working with sandpaper. I have had troubles in the past with chemicals damaging old pieces so now I just take the long road and sand sand sand away. The higher the number, the finer the sandpaper, so start with low numbers and work your way up. The last round will be with the ultra-fine steel wool. Always sand with the grain. 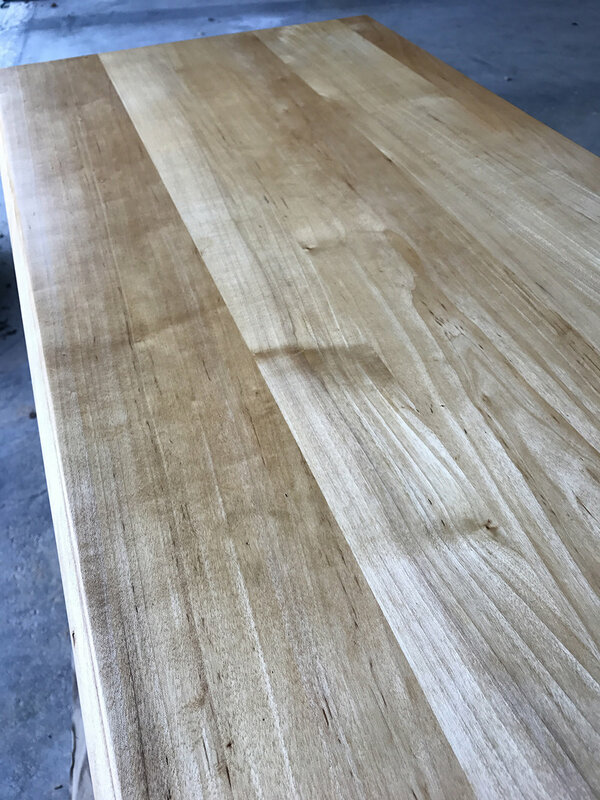 After all the varnish and stain have been sanded down use a wood filler to fill any deep gouges or chips. 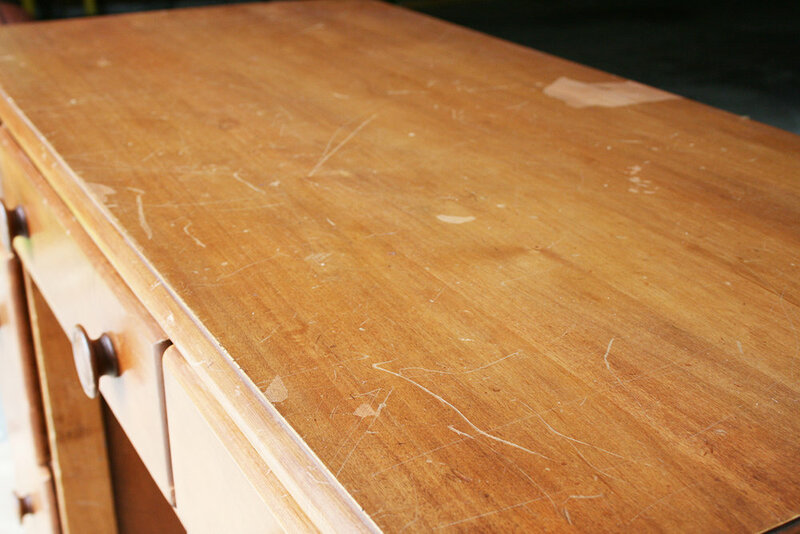 Luckily with this desk, all damage was shallow and taken care of by sanding. If your project needs to be stained then this is the time. 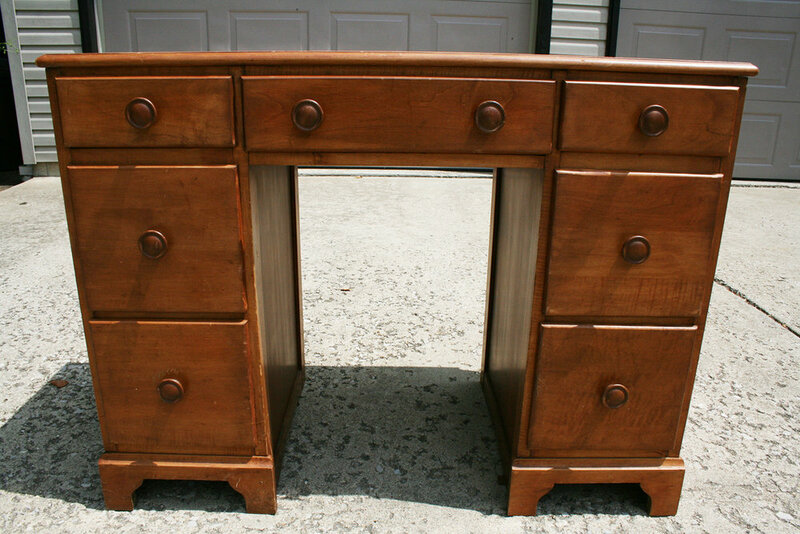 I so fell in love with the natural color of this desk that I decided not to stain it at all. Now the wood is completely bare and needs protecting. I chose to use a clear rub-on polyurethane with a satin finish. This is a very easy product to use and offers a beautiful hand rubbed finish. 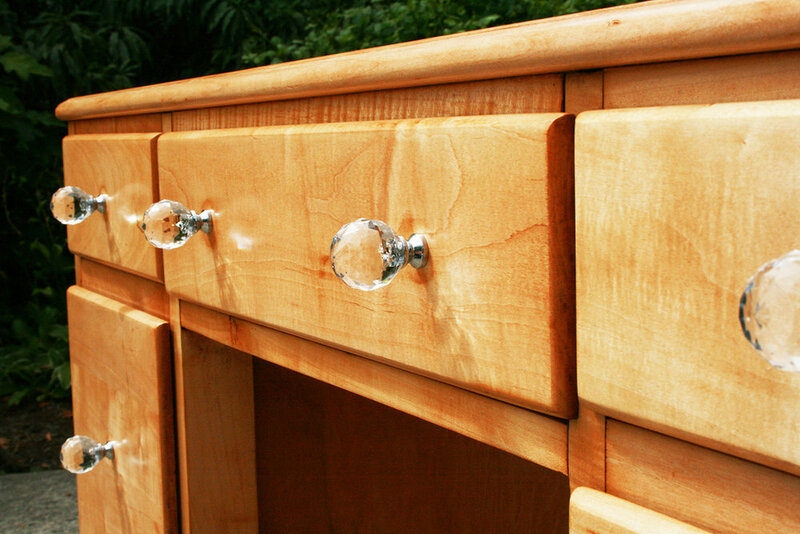 I first used a cloth with some mineral spirits to wipe down the desk to be sure it was clean and free of any sawdust. 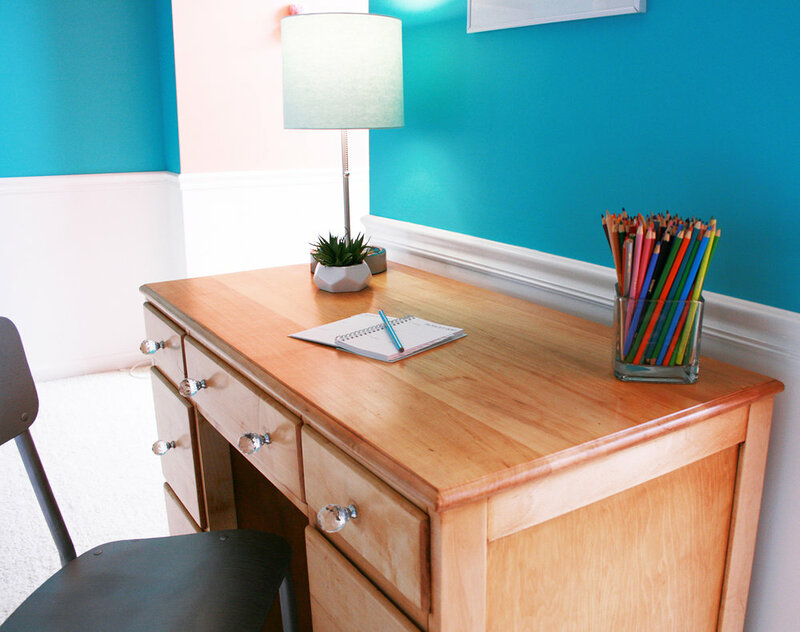 I then used a clean rag to lightly coat the desk with the wipe-on poly. Don’t overdo it. It’s better to use many thin coats than put it on too thick. Let the poly dry a good 3-4 hours and give it another coat. You’ll know when it’s ready if it’s dry to the touch and not tacky at all. I would suggest doing 3-5 coats sanding with an ultra-fine steel wool in between coats to smooth out any rough spots. I’m so happy with how this turned out. 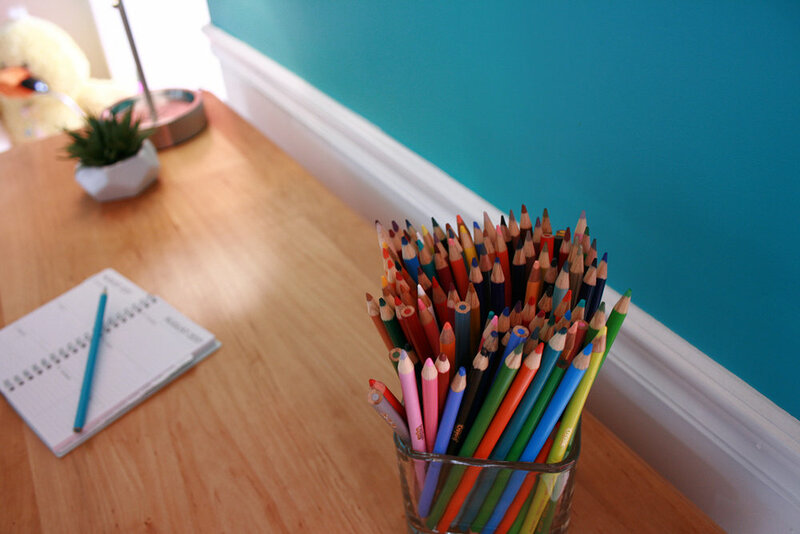 It’s light and bright and perfect for my daughter’s sunny colorful bedroom. After all this effort, I really hope some homework gets done on this desk this year. This story first appeared in The Herald Times on August, 19th 2017. 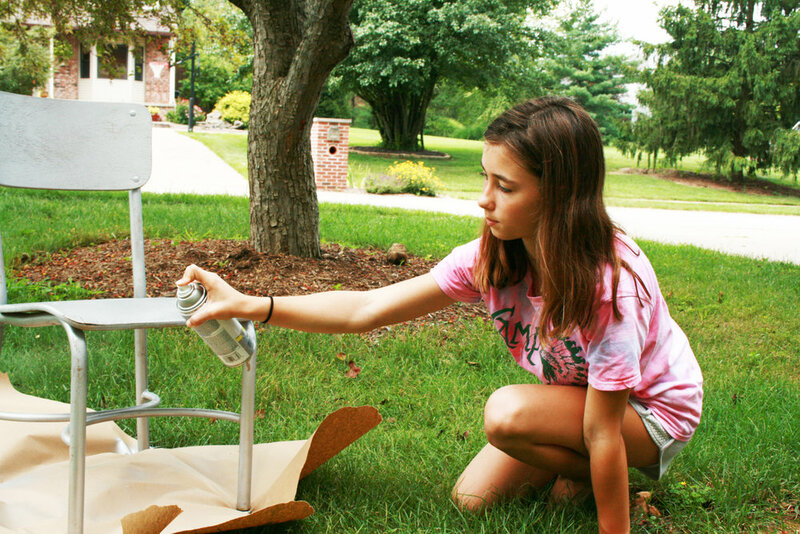 My Sweetbun helping out by spray painting the chair she would use for her new desk.